There will be over $4,000 in cash and prizes!!! 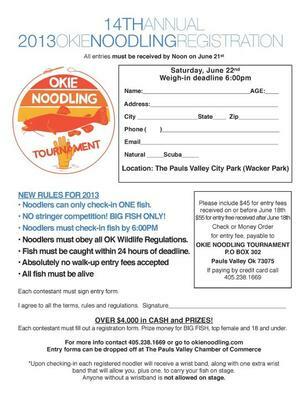 Prize money will be awarded for Big Fish, Top Female, and 18 and under. Noodlers can only check-in one(1) fish. No stringers. Big fish only. Fish must be caught within 24 hours. Must obey all Oklahoma wildlife regulations. Absolutely no walk up fees accepted. All fish must be alive. Right click on the image above to save and print out the registration form. Good luck! Join in and write your own page! It's easy to do. How? Simply click here to return to Fishing News.